While his mainstream exposure pales in comparison to Connor McDavid (and even Jack Eichel), Artemi Panarin capped off a strong inaugural year with the Calder Memorial Trophy as the top rookie of 2015-16. 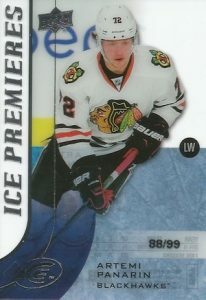 Known as the Bread Man to Hawks fans, veteran play in his debut season has Artemi Panarin rookie cards on the rise. Shop for 2015-16 Artemi Panarin cards on eBay. Panarin begin his professional career in Russia with the KHL in 2008-09. Russian cards documenting this offer the earliest option for collectors to find his hockey cards, including limited signed versions and relics. 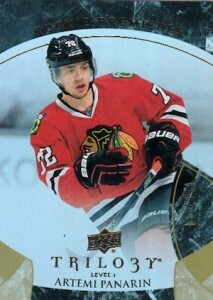 View the Panarin KHL cards that are currently available on eBay. 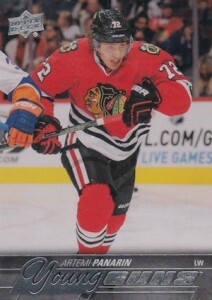 Following several seasons and multiple teams, Panarin made the jump to the NHL, signing a contract with the Chicago Blackhawks in 2015. A little older than most of the other rookies at 24 in his debut season, Panarin quickly adapted to the league. He finished his first year as the leader among all rookies in several key categories, including points and assists. He also stands out playing for a storied franchise and is one of the only top rookies to have already experienced playoff hockey, giving him additional chances to shine on a major stage. 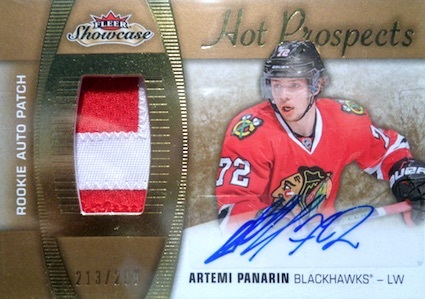 All of the official Artemi Panarin rookie cards come courtesy of Upper Deck and are documented below. In addition to these choices, collectors can find Panarin redemptions in earlier 2015-16 UD products, including Artifacts and MVP. He also has popular Exquisite cards that were included as inserts in other 2015-16 Upper Deck products. It is important to note that Artemi Panarin NHL autographs moved very slowly and each of his early options are found as redemptions. 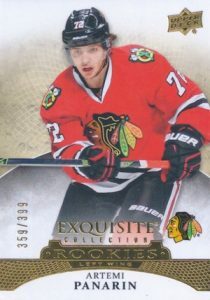 Curious about specific Artemi Panarin rookie card values? Simply follow the links to eBay and check the completed sales. Click on the listings or images to shop for cards on eBay. Linked sets in the descriptions go directly to detailed product profiles. 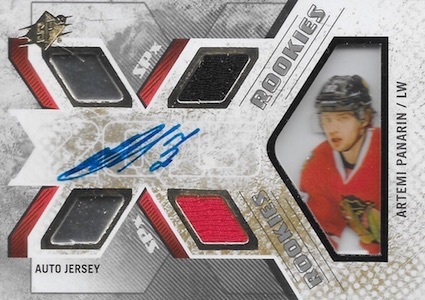 One of several Artemi Panarin autographs issued as a redemption, the live 2015-16 Fleer Showcase rookie card is out now. Limited to 299, the finished product sports a horizontal layout, moderate patch and sticker autograph. In addition to the signed rookie relic, the set also features multiple 90s-themed inserts that include Panarin. 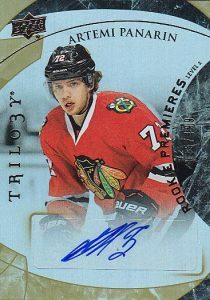 Another signed Artemi Panarin rookie card that was issued as a redemption, 2015-16 OPC Platinum features a chromium design and on-card signature. While not numbered, the rare Panarin card is part of Group B (along with Max Domi), which has overall odds of 1:2,697 packs. Limited to just 72 copies — Panarin's jersey number — 2015-16 SP Game Used is likely to be one of the toughest to locate. Despite this rarity, there are several other versions that are much more plentiful and add relics the design. Heavily relying on the "X" aspect of the brand, the loud design in 2015-16 SPx has plenty of fans and critics. Originally issued as a redemption, this Artemi Panarin rookie card carries a print run of 399 copies and features two small relic pieces and a sticker autograph. The top overall card for many, Young Guns are a modern staple for hockey collectors and will always enjoy considerable interest despite their relative simplicity. 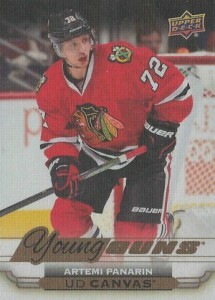 In addition to limited parallels, collectors can also track down the UD Canvas Young Guns insert for Panarin in 2015-16 Series 1 Hockey. 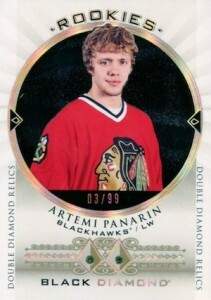 Although not quite as rare as the SP Game Used rookie, the main Artemi Panarin option in 2015-16 Black Diamond adds Double Diamond Relics to a limited print run of 99. This has led to strong values and puts it high on the list for collectors. 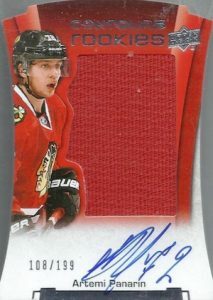 A die-cut design, large swatch and on-card signature immediately gives the 2015-16 UD Contours rookie card for Artemi Panarin a distinct look. 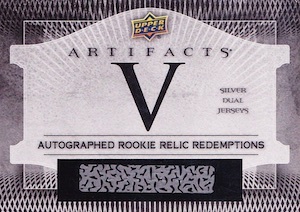 Like the other Panrin autographs, redemptions are found in boxes but the card is now live. 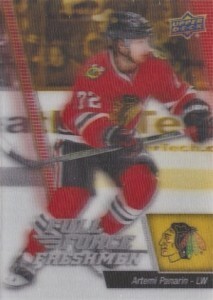 The card may not look like much in the image below, but Artemi Panarin's 2015-16 Full Force rookie is much better in person thanks to the 3D technology. Part of a short-print subset, they are not the easiest to pull but values remain reasonable. 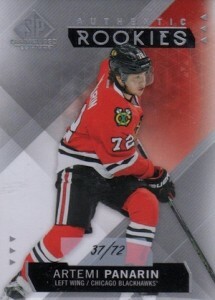 One of the rarest first-year base cards for Panarin, 2015-16 Upper Deck Ice is a top rookie card despite the lack of autographs or relic pieces. Rarity and brand strength push this acetate card near the top for collectors. 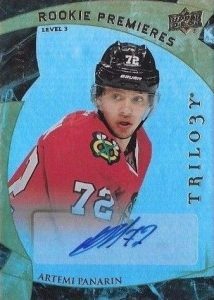 Offering a trio of Artemi Panarin rookie choices, 2015-16 Upper Deck Trilogy kicks things off with a solid base Level 1 RC that is numbered to 999. Level 2 and Level 3 feature more rarity and add a sticker signature. While the autograph cards were issued as redemptions, they are now showing up.